Though the IP Office still supports the 4606, Avaya no longer sells this phone. Customers are encouraged to use the 4610 or 5610 with the IP Office. Click here for a larger view of this phone. 6 Programmable call appearance/feature keys with twin lamps. 8 Fixed Feature Keys: Speaker, Mute, Hold, Volume Up & Down, Conference, Transfer, Redial. 2 x 16 Character Display. Full Duplex Speakerphone with Echo Cancellation. G.711, G.722, G.723.1a, G.729a/B Voice CODECs. QoS Options Of - UDP Port Selection, DiffServ And 802.1p/B. 10/100 BaseT Ethernet Connection to the IP Office. Optional Integrated Ethernet Repeater Hub – for pass through connection of a PC via the phone. IP Address Assignment - DHCP client or statically configured. Infrared Port To Support Future Applications. Downloadable Firmware for future upgrades. Wall Mountable with a separate orderable stand. Connects to IP Office via the LAN. 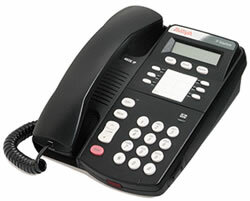 Note: The 4600 series phones are compatible with Definity and Avaya IP Office platforms. Back to the main Avaya 4600 VoIP phone page.